Hold on tight, everypony! My Little Pony: The Movie is blasting to theaters on October 6! 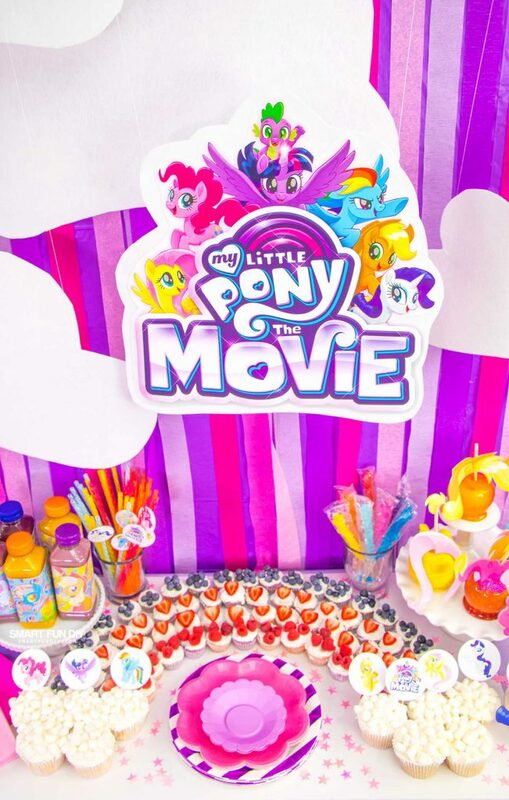 We are so excited for the My Little Pony: The Movie that we threw a party for all of our Bronies and Pegasisters. 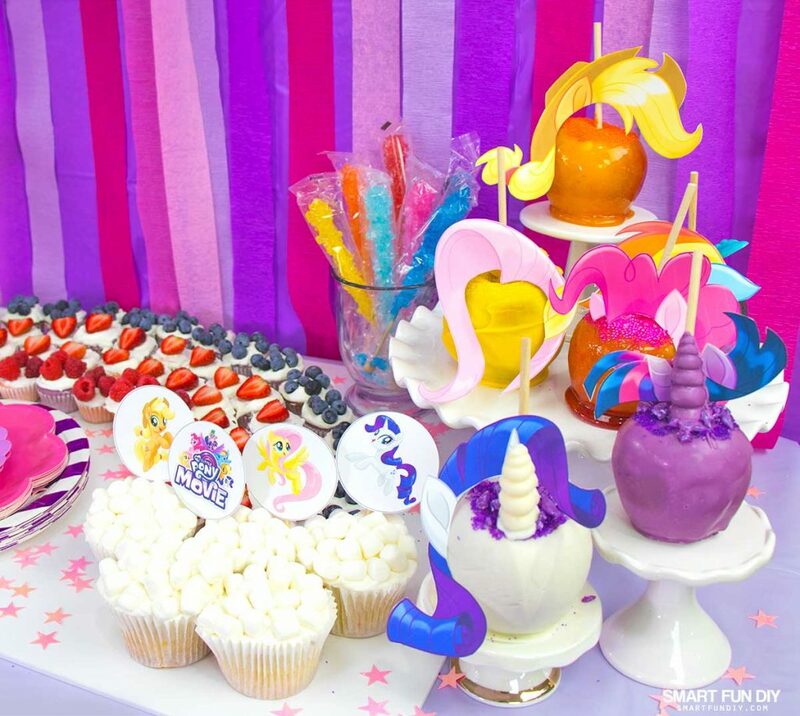 No matter the time of year, it's always a good time to throw a My Little Pony themed party, right? 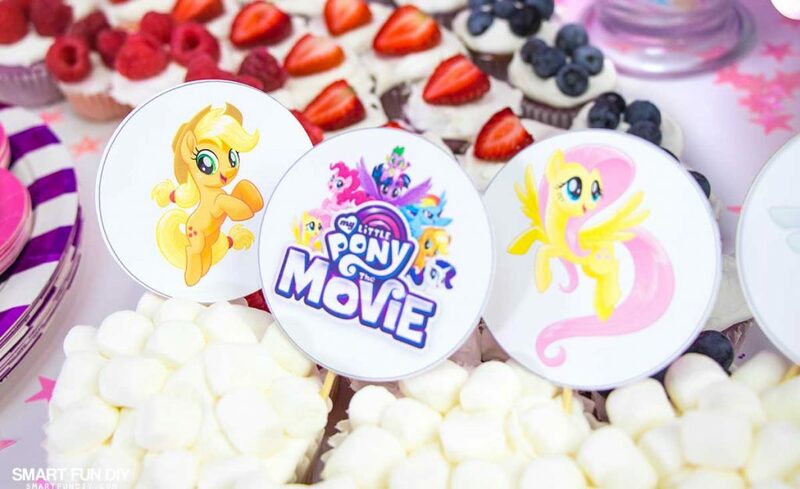 We've packed this party with free printables, fruity fun food ideas, and lots of pony power that every one of your pony friends will enjoy in celebration of My Little Pony: The Movie. On October 6, friendship is magic! 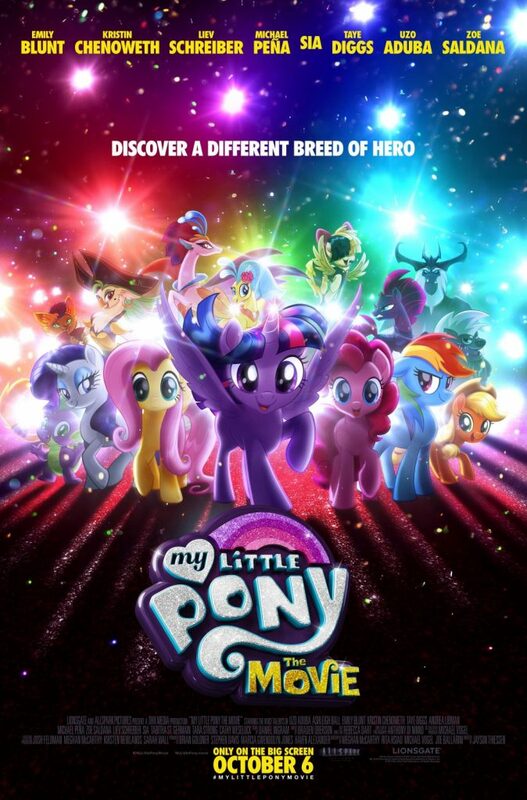 Watch the trailer for My Little Pony: The Movie & join the littlest ponies on a BIG screen adventure. In My Little Pony: The Movie a dark force threatens Ponyville! 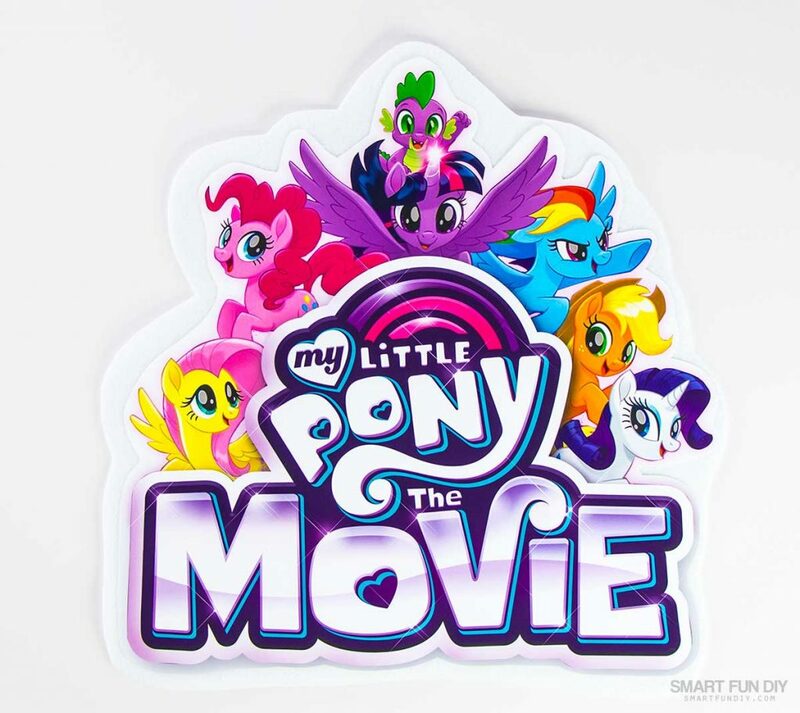 The Mane 6 – Twilight Sparkle, Applejack, Rainbow Dash, Pinkie Pie, Fluttershy, and Rarity – embark on an unforgettable journey beyond Equestria, where they meet new friends and exciting challenges on a quest to use the magic of friendship to save their home. The all-star voice cast includes Emily Blunt, Kristin Chenoweth, Liev Schreiber, Michael Peña, Sia, Taye Diggs, Uzo Aduba and Zoe Saldana., featuring original music and songs performed by Sia, Diggs, Saldana, Chenoweth and Blunt. 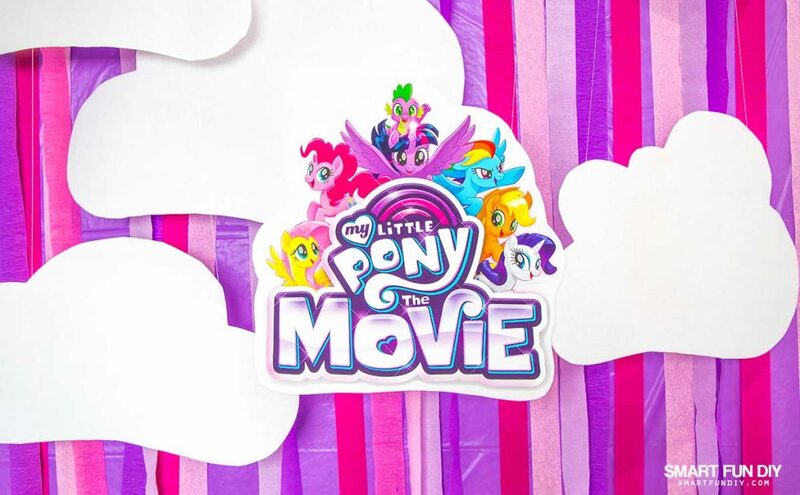 We can't wait to see some of our favorite stars in this fun family film, My Little Pony: The Movie! 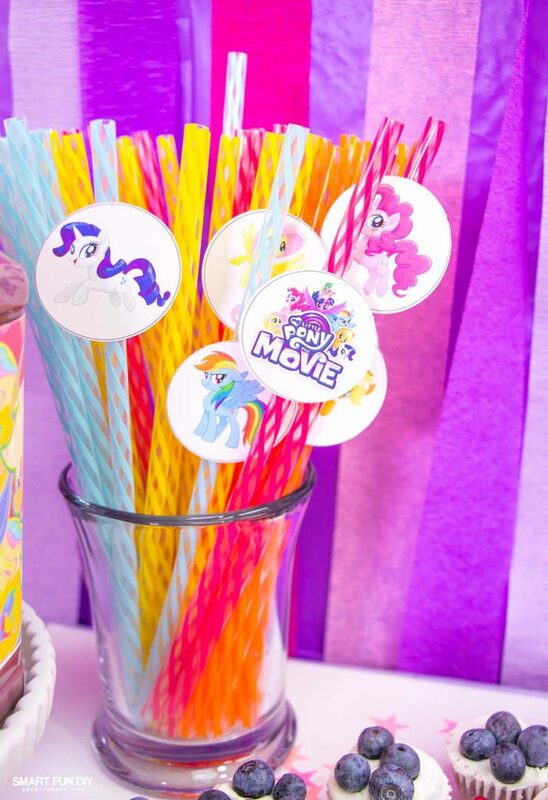 How to DIY the ponyest My Little Pony Party eva! We called up all of our fellow Bronies and Pegasisters for a fun party to celebrate the October 6 release of My Little Pony: The Movie! 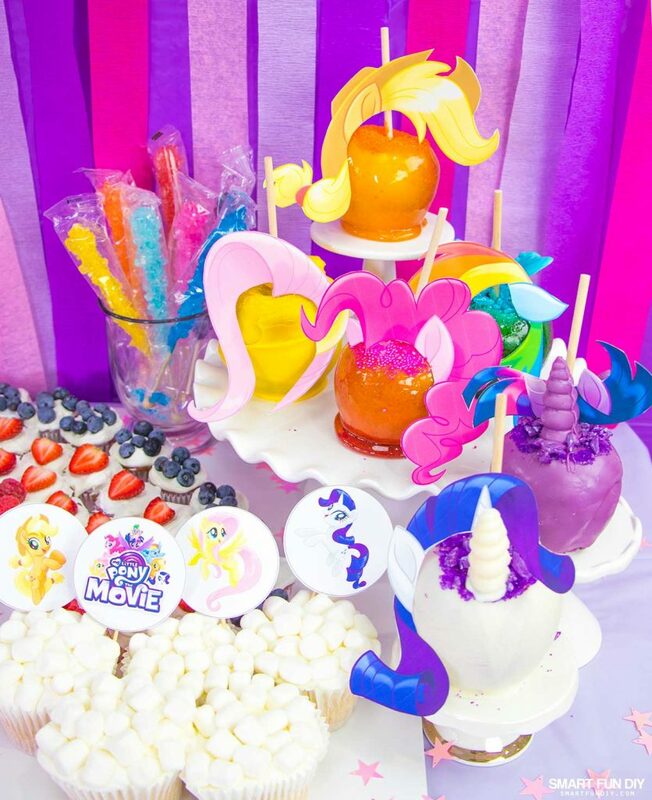 You could use these same ideas to throw the ponyest Halloween party or birthday party … or just because you're REALLY REALLY REALLY into My Little Pony. We don't judge! This party spread comes together easily and is budget-friendly. 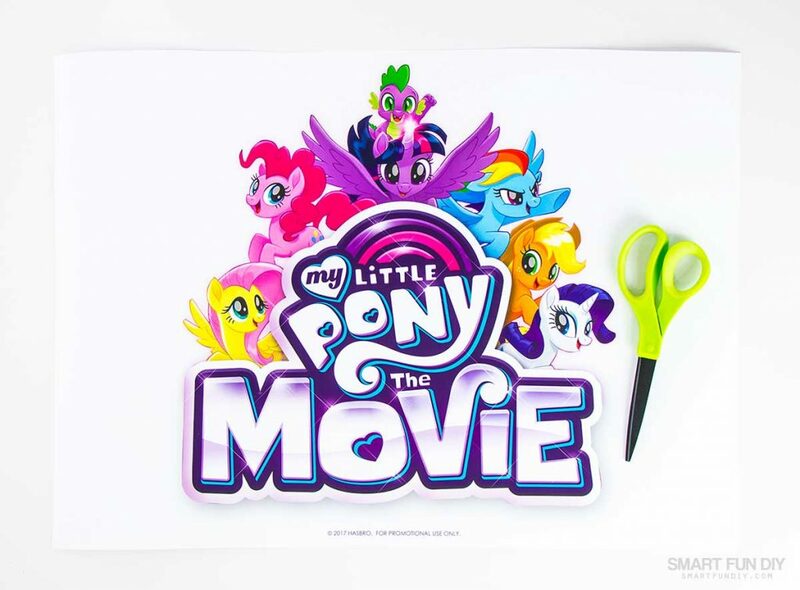 We've created a huge packet of printables to help you make this party over the top with DIY pony-goodness from My Little Pony: The Movie, including official artwork. 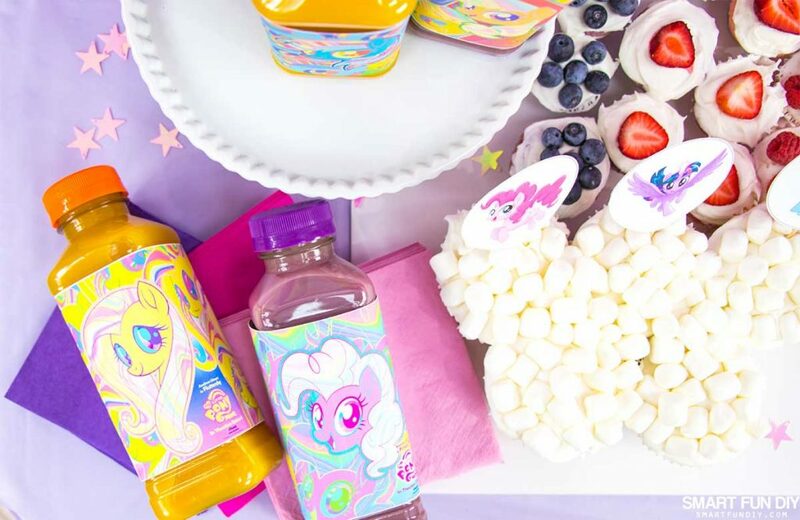 CLICK HERE to subscribe to our newsletter and get instant access to the My Little Pony printables and a series of emails about how to make your party the most amazing ever! 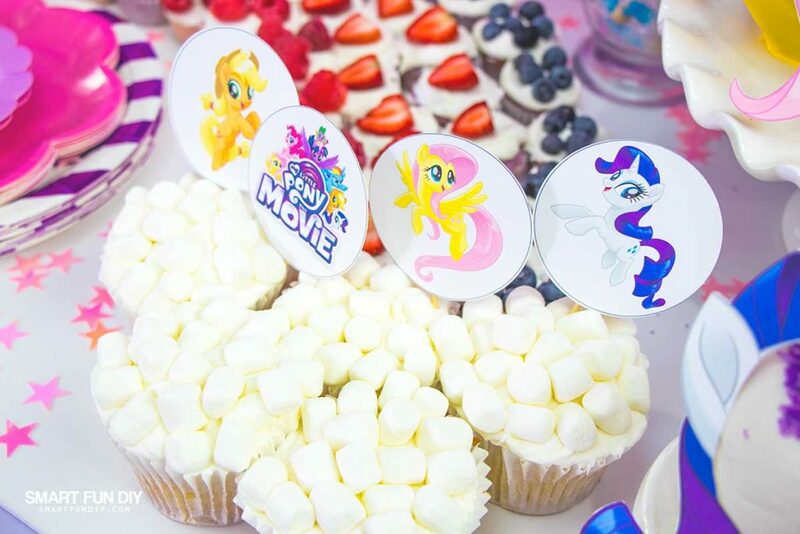 Once you have your printables downloaded, keep reading to see how we put the party together, including how to create unique, My Little Pony themed snacks. Sparkles and rainbows, that's what it's all about, right? 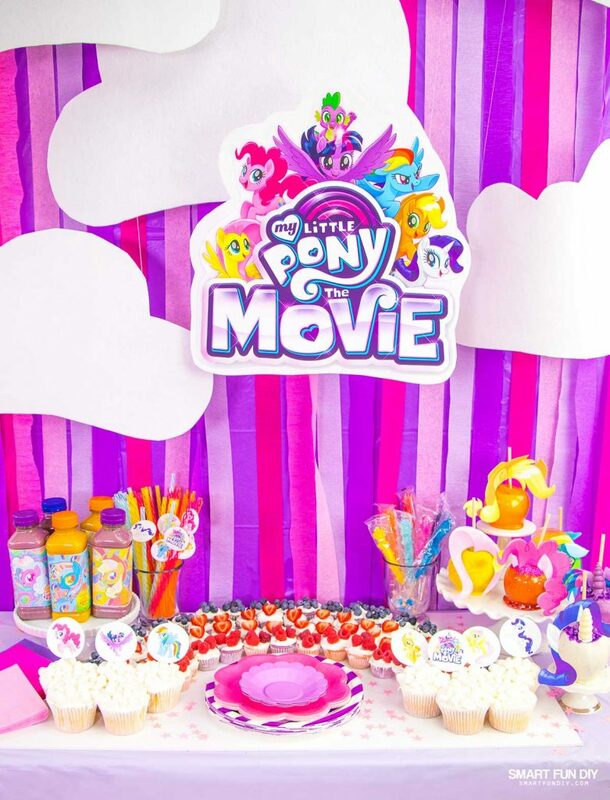 We drew inspiration from the characters in My Little Pony: The Movie, pulling colors and decor ideas from the logo and the personalities of each character. Free printables. Look online for FREE printables like the ones I just shared above. Printing your own party decorations is super affordable and allows you to customize everything to YOUR party! Get inspired by the Logo. 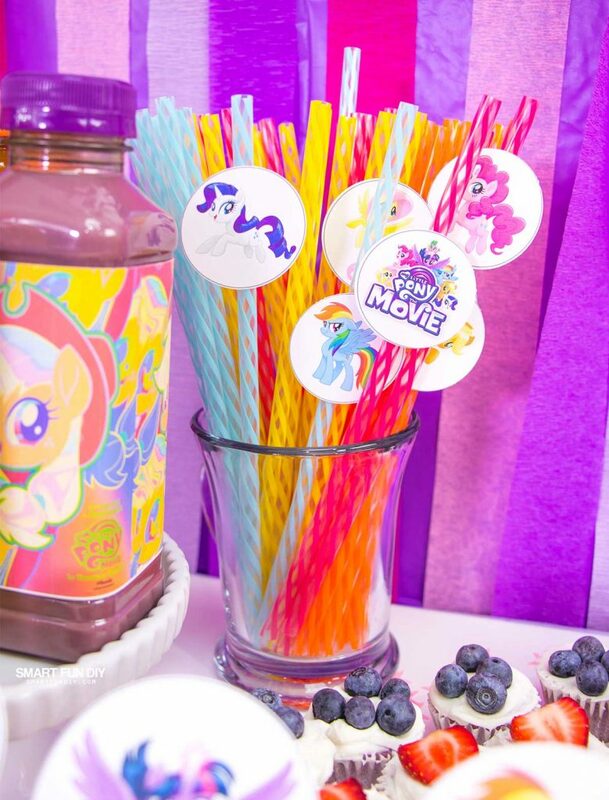 Use the colors of the My Little Pony logo as inspiration – we stuck to shades of purple and pink to make this party POP! We took inspiration from the rainbows to create the rainbow food as well as from the scenery to create the felt clouds we hung over the backdrop. Table scatter rules! 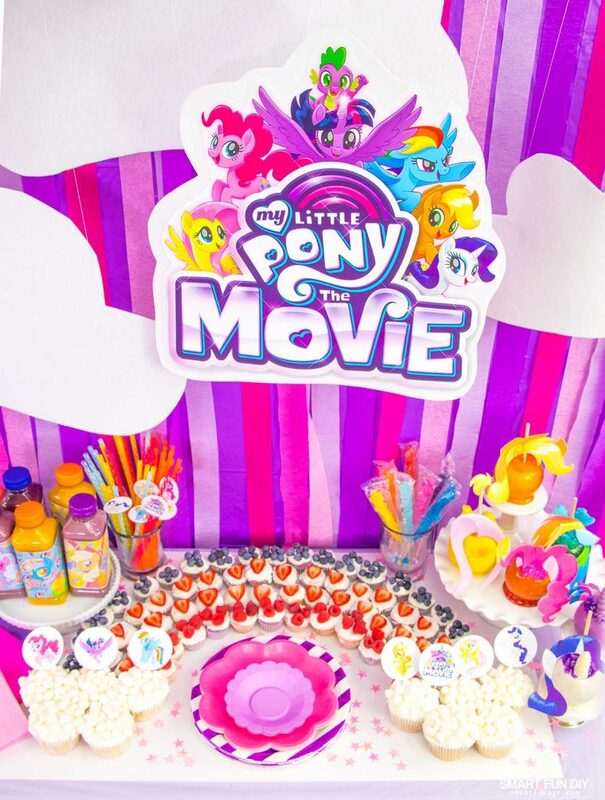 Sprinkle the table with sequins or confetti on the My Little Pony logo colors. Easy backdrop. Hang a plastic tablecover on the wall with clear pushpins. Hang color-coordinated crepe paper streamers from a strip of clear packing tape at the top. 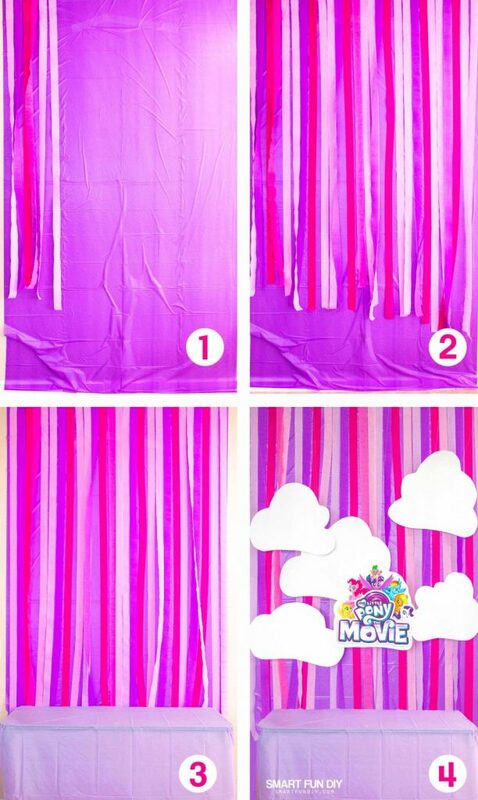 Cut clouds from white felt and hang them from the ceiling with fishing line and clear pushpins. Use the movie poster! Print a movie poster or giant logo at an office store for about $15. For this poster, I asked them to print it to 24″ wide by 18″ tall. Be sure to tell them you want it printed in landscape (horizontal) … the office store I went to printed this in portrait (vertical) the first time around … ay yi yi! Lesson learned! Cut out and mount on white felt, which you can get for under $4 a yard. White dishes “go” with everything. Build the food displays on white cake plates (they go with everything) and foam core board. Yup, you don't need fancy plates! The dollar store is party central! Grab cute plates and napkins on solid colors from the dollar store. I got these super cute reusable party straws in a dollar section! 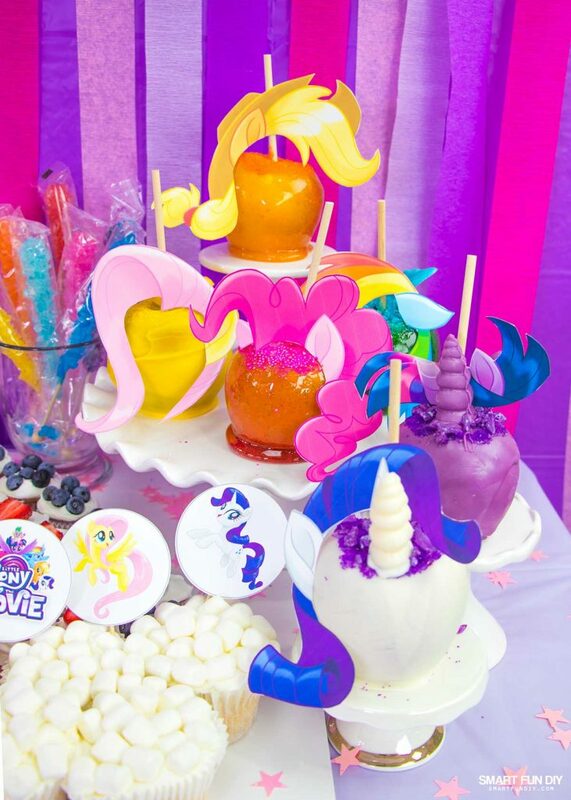 Here's all the party decor you'll need to pull off the ponyest party ever! When I go to a party, I am always looking for something fresh and yummy. But we all love sweets, right? 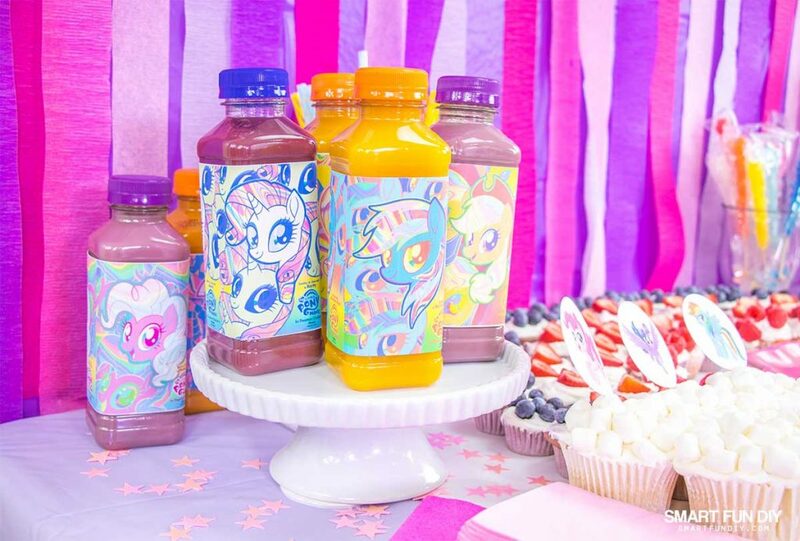 We created a “sweet” display that has fresh fruit and fresh fruit juice at the center, for snacks that Bronies and Pegasisters of all ages will love! Using standard cupcake liners and a standard cupcake pan, bake 10 cupcakes, following the directions on the cake mix box. Allow to cool. In the largest bowl, add 2 drop of violet gel food coloring. Stir gently until blended. In the first small bowl, add 2 drops of pink gel food coloring. Stir gently until blended. In the final small bowl, add 2 drops of fuchsia gel food coloring. Stir gently until blended. 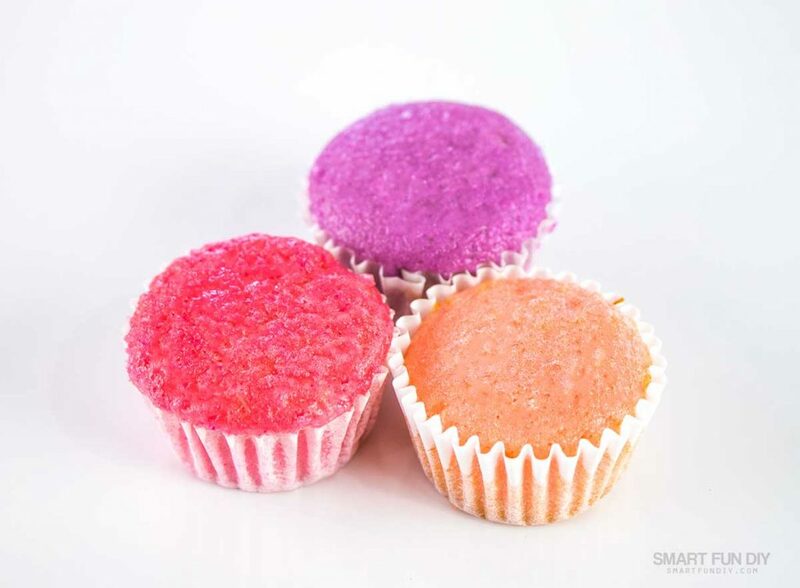 Using mini cupcake pans and liners, bake approximately 64 mini cupcakes using these colored mixes, following the directions on the cake mix box. Allow to cool. 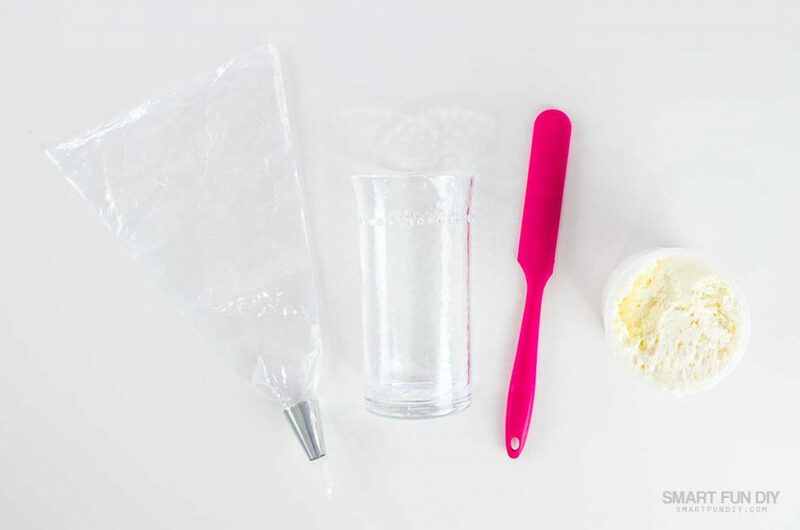 Insert a round tip into a piping bag. Fill the piping bag with frosting. Pipe onto all cupcakes. Spread the piped frosting evenly over the top of each cupcake. 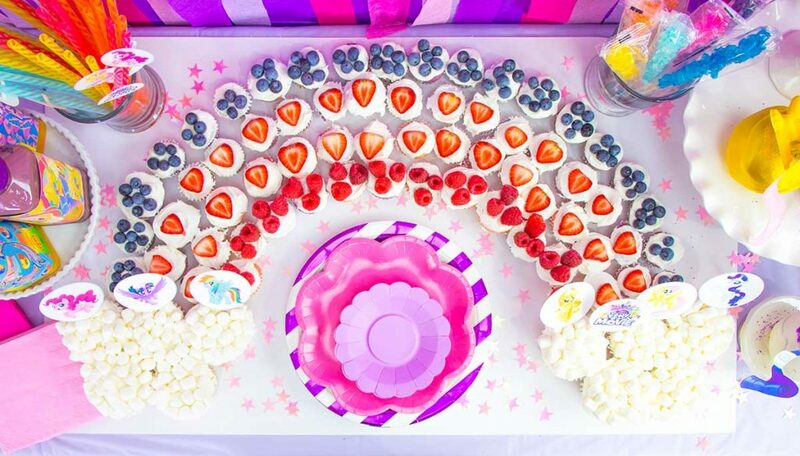 Arrange the cupcakes on the foam core board in a clouds and rainbow pattern. Add mini marshmallows to cover the “clouds”. 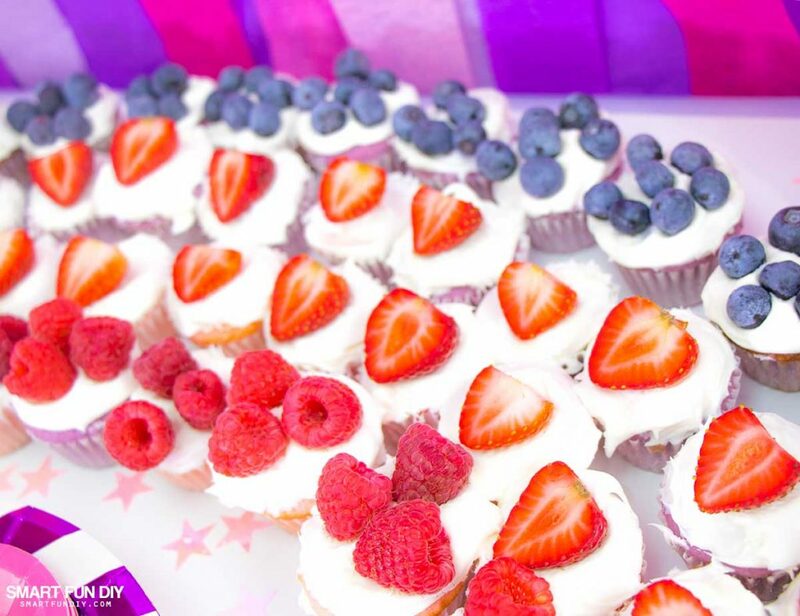 Add raspberries, blueberries, and strawberries to the mini cupcakes to cover the “rainbow”. Keep the pony power flowing by serving fresh fruit juices rather than sodas or sugary punch. Trim the printable wrappers with scissors or a paper trimmer. Apply adhesive to the back of one short edge of the wrapper. Wrap the paper strip around the juice bottle, starting at the end without adhesive. Press the adhesive strip down tot he paper to secure the wrapper in place around the bottle. With a 1.75″ hole punch, cut out each topper. Cut the strips out with scissors. Apply a glue dot to each end of the strip. Lay the topper face side down. Lay the straw on top. Lay the strip across the straw and press the ends down, onto the topper. Put in a pretty cup on your party table! 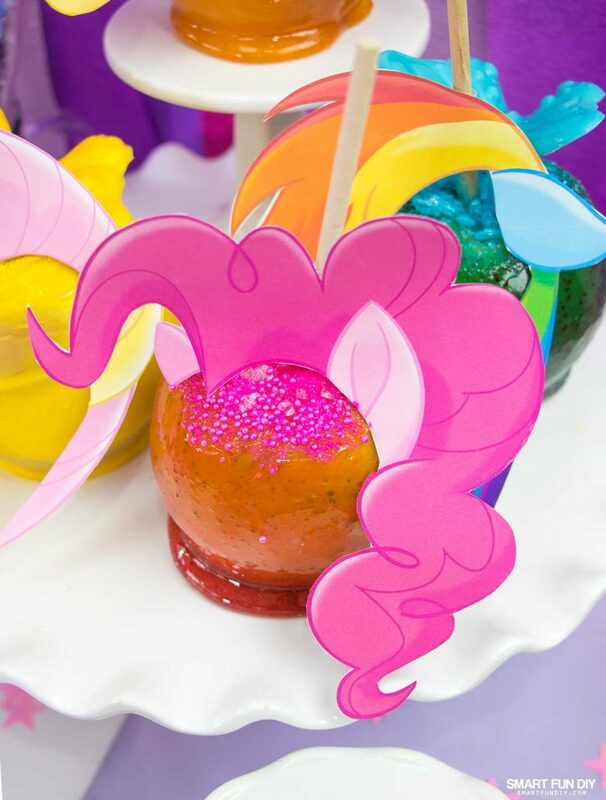 My Little Pony Candy Apples – how to make Jolly Rancher Candy Apples! Apple season is here and in a nod to Apple Jack, we thought candy apples would be a fun party food to set this My Little Pony party apart from the rest. Each character of the Mane 6 is represented as a candy apple, complete with a printable mane! 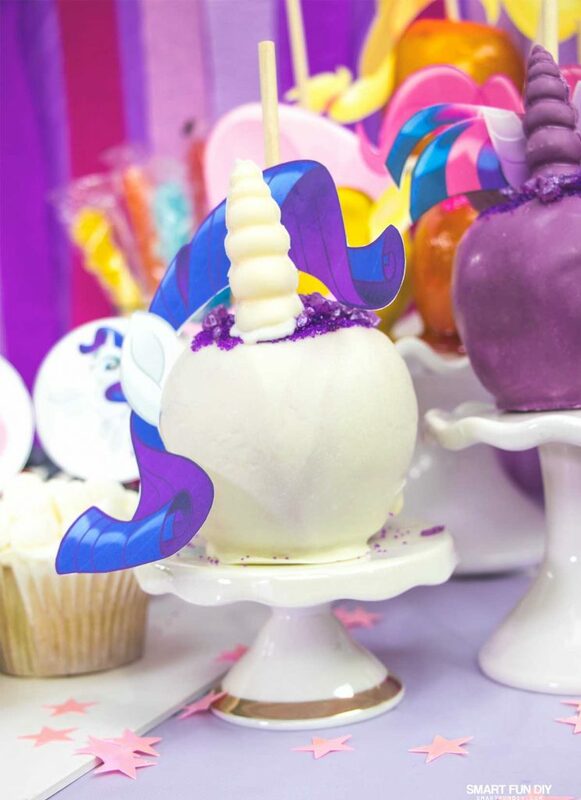 CLICK HERE to subscribe to our newsletter and get instant access to the My Little Pony printable manes for the candy apples. My parents have an apple orchard. Right now, the Rome apples are ripe and ready so that's what we chose to make our candy apples. Granny Smith apples also work great for candy apples because the sweetness of the candy coating cuts the sour flavor of the apple. We decided to use Jolly Ranchers to make these candy apples because it is a lot easier than making homemade caramel or melted sugar. Plus, the candies are already flavored so all you have to do is decorate! We also made some of the apples with colorful white chocolate for the colors we couldn't find in Jolly Ranchers or when the Jolly Ranchers weren't giving us the pop of color we really wanted. We topped these apples with a mix of colored sugar crystals and sprinkles we got at a bake shop. Insert the wood sticks into the apples. 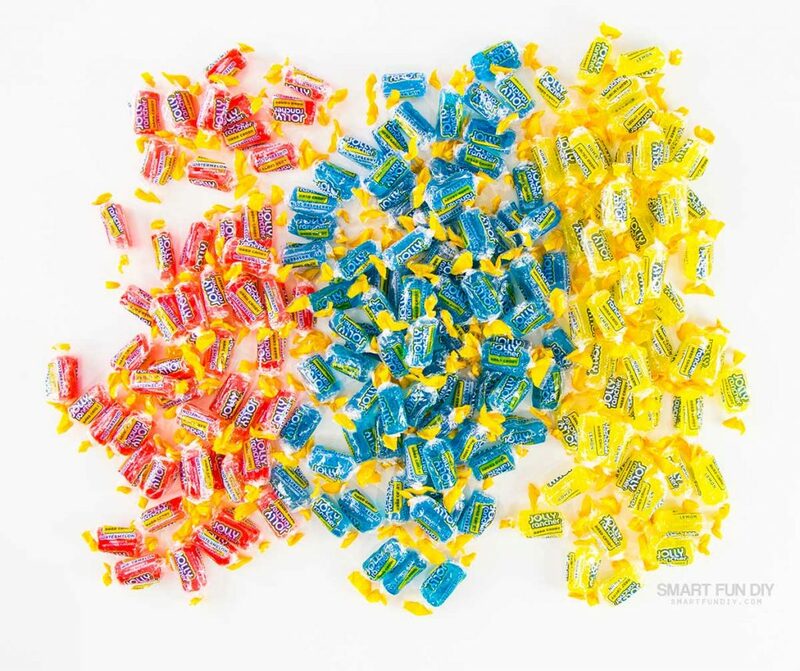 Unwrap the Jolly Rancher candies. Place each color of Jolly Rancher candy into a clean metal cake pan. Place into the oven for about 15 minutes, until melted. Carefully stir 1-2 TBSP of edible glitter into the hot candy until mixed. Place back int he oven for another 3-5 minutes. Remove the cake pan from the oven, taking care to not burn yourself. Carefully tilt the pan to the side, allowing the hot candy to pool. Twirl the apple in the pool of hot candy until coated. Gently pull the apple up out of the hot candy, allowing the excess candy to drip back into the pan. Place on a silicone baking sheet on a heat resistant surface to cool. 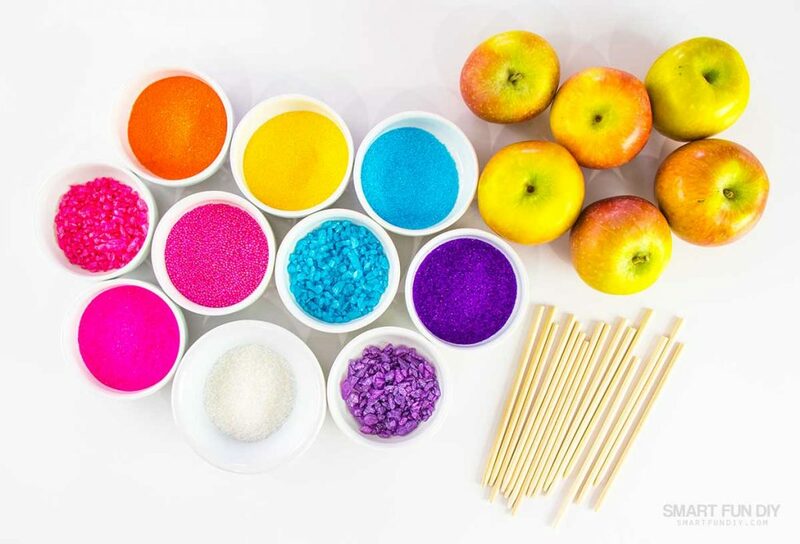 When the apples have cooled, apply piping gel to the top and sprinkle with glitter, rock candy, and candy sprinkles to decorate. Allow to set. Add the My Little Pony Candy Apply Toppers following the directions below. 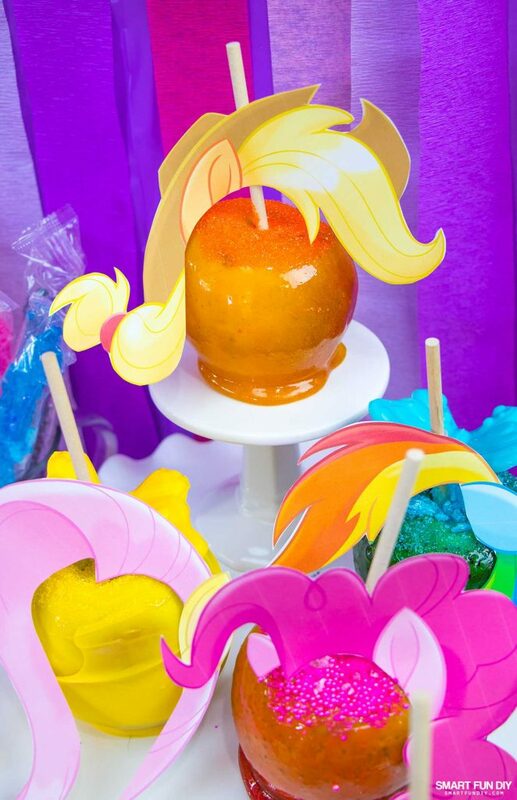 We used this technique to make candy apples inspired by My Little Pony's Applejack, Pinkie Pie (see how cute it turned out! ), and Rainbow Dash. 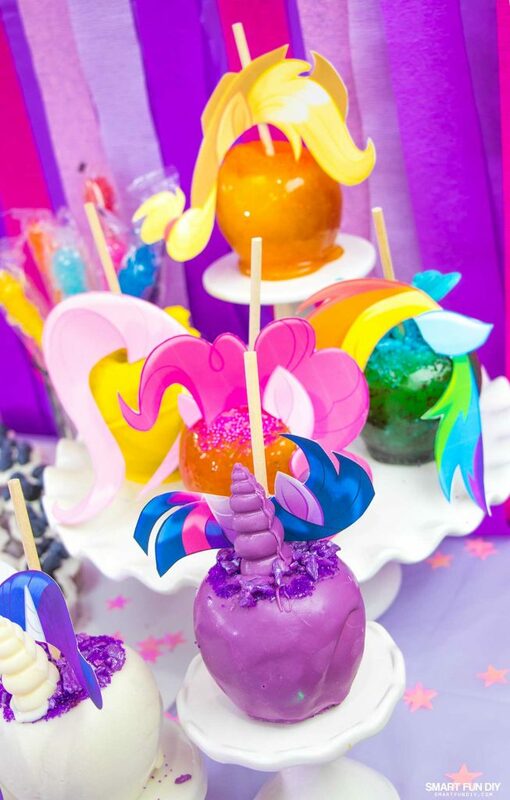 Creating candy apples inspired by Twilight Sparkle, Fluttershy, and Rarity, we had trouble finding Jolly Rancher candies in colors that would show up well on a candy apple. We got yellow (Lemon) Jolly Ranchers candies but the candy apples we made with them looked more green … we'll be using those for a Halloween candy apple party later! 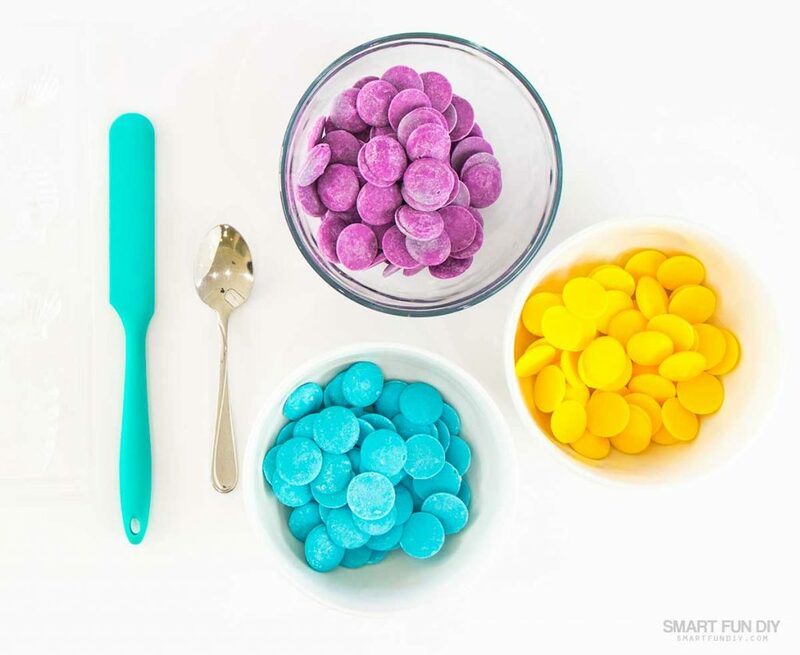 Place each color of colorful candy melts into a microwave safe dish. Heat the melts in the microwave, following the directions on the packaging. You may need to add a thinning agent or dipping aid to make the chocolate looser so it will stick to the apples. Carefully tilt the bowl to the side, allowing the hot candy to pool. Twirl the apple in the pool of hot candy until coated. Gently pull the apple up out of the hot candy, allowing the excess candy to drip back into the pan. To make the unicorn horns for Twilight Sparkle and Rarity, we use a shell candy mold. We made two shells for each color, chopped off the ends, and used more melted candy to stick the two halves together to form one unicorn horn. We then used more melted candy to “glue” the horns and wings to the candy apples. 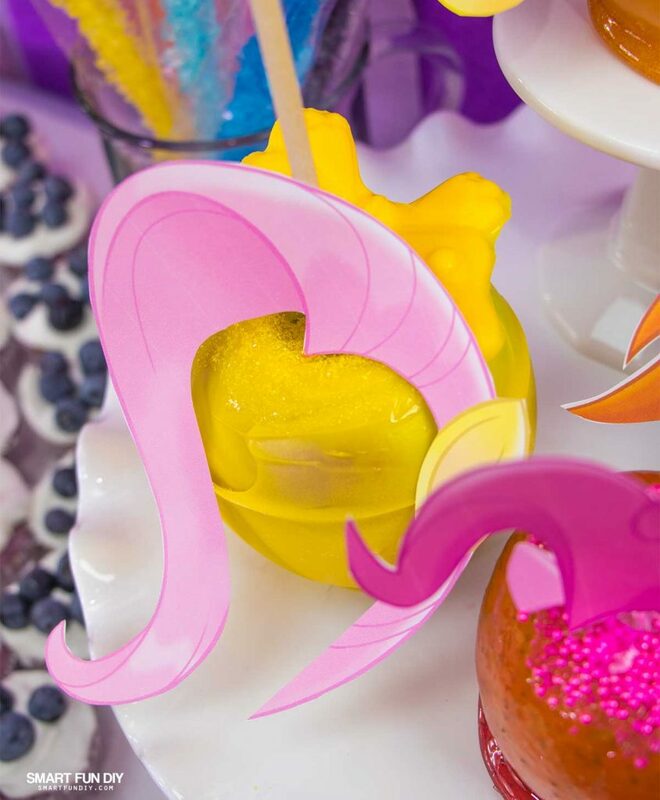 These unique candy apple toppers make them look like your favorite My Little Pony characters! Cut out each piece of My Little Pony “hair”. Cut out both sides of the hair if you're making double-sided candy apples or just one of each for single-sided apples. For double-sided toppers, apply glue to one side of the hair. Sandwich the apple stick between the pieces of hair and press together, allow to dry. For single-side toppers, sandwich the apple stick between the hair and a piece of tape. Press to secure. Want to download all of these recipes? CLICK HERE to subscribe to our newsletter and get instant access to the My Little Pony printables. Now you're ready to party like a pony! 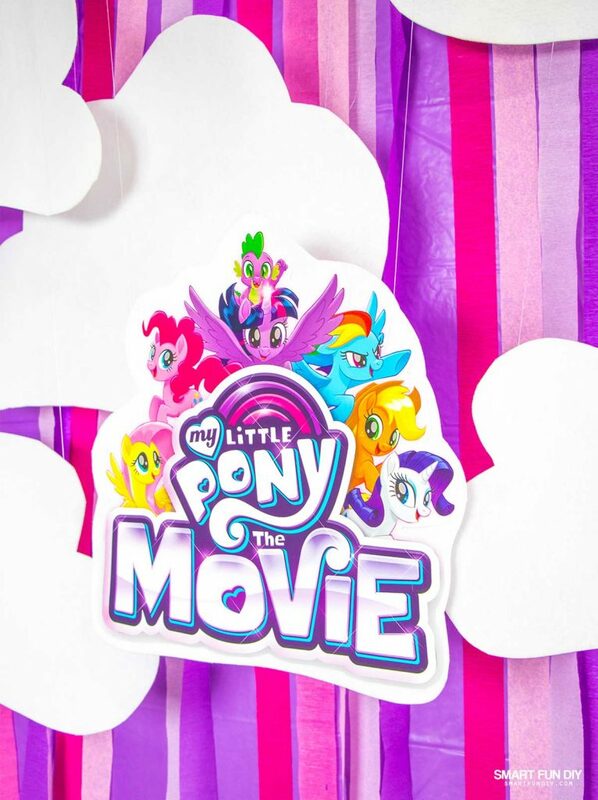 The movie event of pony proportions is coming to theaters on October 6! Throw a bash with all your friends to kick off the fun … are you ready?! Which Pony is your fave? Let me know in the comments!